Now you can tell family members, friends, colleagues and your mother-in-law to “Stuff it!” when they get in your face about how you’re managing your diabetes. You know, that finger-wagging, judgmental tone and unsolicited comment about, “Should you be eating that?” or “What’s your blood sugar?” As if all this work wasn’t enough. 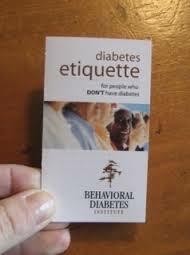 That’s because the Behavioral Diabetes Institute (BDI) – founded by Bill Polonsky – have put out these nifty little Etiquette Cards to keep those of us who live with diabetes sane – and safer – from interfering busybodies and self-ascribed do-gooders. I joke, but these provide great little tips both to educate one’s self and those around you. If you haven’t heard of the BDI it’s one of the very few diabetes centers that help patients cope with the emotional stresses of diabetes: burn-out, depression and being off-track with your management through seminars and workshops. You can download the Etiquette Cards or send away for them.